Yuri Possokhov, Swimmer, 2015. Performance view, April 10, 2015, San Francisco Ballet. Photo: Erik Tomasson. These are the sorts of statements one can somewhat get away with if possessed of a marvelously lugubrious, thick Russian accent. Such an accent has Yuri Possokhov, who I recently encountered during an audience fluffer for the premiere of his newest work, Swimmer, at San Francisco Ballet, where he is choreographer in residence. Ballet as closed loop. It’s so easy to feel that, especially compared to combustible eras and figures of yore (hello, nostalgia). Swimmer shared a bill at the War Memorial Opera House with George Balanchine’s 1946 leviathan The Four Temperaments, and a season with Alexei Ratmansky’s Shostakovich Trilogy, 2013, an homage to the embattled composer who has long been a source of inspiration for Ratmansky. Ghosting my viewing of all of these made-by-Russian-American ballets was Leonid Yakobson, the Soviet-era contemporary of Shostakovich—both men died in 1975—and the ballet contemporary of Balanchine, who, like him, was born in January of 1904. Twenty years later the future founder of New York City Ballet defected from the Soviet Union, something Yakobson apparently never sought to do, despite being given repeated cause. Yakobson is the subject of Janice Ross’s new book Like a Bomb Going Off: Leonid Yakobson and Ballet as Resistance in Soviet Russia (Yale University Press). Ross, a prominent dance history scholar, has just given a series of talks in San Francisco on Yakobson, including one at the ballet tracing connections between him and Ratmansky and another at the Contemporary Jewish Museum called “Disobedient Dances: A Jewish Choreographer in Soviet Russia” that featured live snippets of his work performed by two San Francisco Ballet students. I wonder what Yakobson would make of Swimmer, a multimedia-infused collage of decades-past Americana possessed of a surging, undulating physicality now prevalent in contemporary ballet. It’s a pretty concoction; does it have an ambition beyond pleasing the eye? 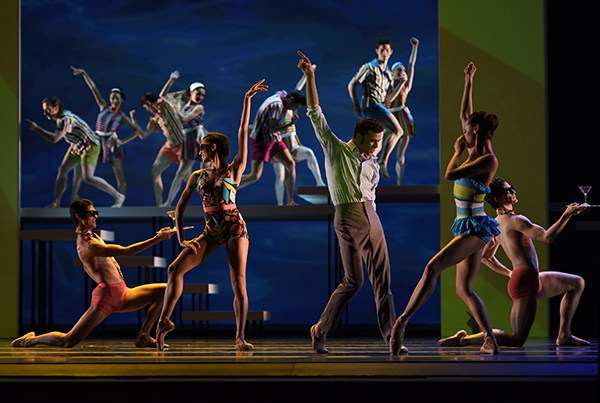 Cheever, at one point dubbed the Chekhov of the Suburbs, offers a starkly empty portrait of the suburban American male, and beyond the ballet’s ridiculously nostalgia-drenched imagery (hello, Mad Men), Possokhov’s hero grows similarly lost and isolated. Is he so different from any storybook ballet prince, desperately seeking someone or thing? One of the things that makes Ross’s portrayal of Yakobson so compelling is the larger connections she draws between ballet and political resistance, juxtaposing the overt against the coded. So we see present-day Ukrainian ballerinas performing the iconic dance of the cygnets in front of tanks in protest of the Russian invasion, as Ross reminds that Swan Lake—a ballet that is, above all, about freedom—has long been a tool for both dissidents and the state (which in times of unrest has broadcast loops of the ballet on television). Are there remnants of this resistance in the work of Ratmansky or Possokhov? One could argue yes—the former takes aim at a repressive regime, the latter a permissive narcissism. Are these critiques, or merely depictions? It’s striking to consider these men next to Balanchine, whose strongest works are inarguably of their time. Balanchine spoke ardently against plot, against politics—and yet in a ballet like The Four Temperaments, can one not see laid out all the peril and promise of a century predicated on an idea of progress? Yakobson, too, drew from the world around him, only at great risk, embedding within his ballets forbidden material, such as Jewish cultural motifs, and insisting on the portrayal of men who did not fit the approved Soviet mold. These portrayals ripple through the solo Vestris, a work whose broad theatricality housed layered critiques of ballet history, official Soviet values, and the toll of forever policing one’s behavior. Here we have the anguished male protagonist as both historical figure and allegory. In her lectures, Ross also included grainy black-and-white footage from 1969 of Yakobson coaching a young Mikhail Baryshnikov in Vestris. The emphasis, Ross argues, is entirely in the putting on of the mask—something these two artists would have understood all too well. Leonid Yakobson coaching Mikhail Baryshnikov in 1969 for Vestris. Ratmansky’s ballets are full of bravura men; their tricks are showstoppers that somehow don’t stop the show, but feel necessary to it. Another form of code? The prince as Soviet gymnast, with no way to fly except on stage. At a recent panel at Danspace Project (full disclosure, it came at the end of the Platform I had curated), David Hallberg spoke eloquently about certain deficiencies he sees in the ballet world. An American Ballet Theatre star and the first American to join the Bolshoi Ballet as a principal dancer, Hallberg, like the restrictive circle of storybook heroes he cycles through on stage, is a restless and buoyant force. The task Hallberg faces is much trickier—what slumbers isn’t the princess, but the populace, and happily so. He ended by asking, “What is this moment? What is now?” Good words to keep in mind as ballet choreographers, even the more progressive ones like Ratmansky and Christopher Wheeldon (currently wowing the crowds with An American in Paris—talk about nostalgia), look endlessly to the past.